Lee Cruz and his brother came to the coop to say goodbye yesterday afternoon. Lee leaves for the States on Thursday. 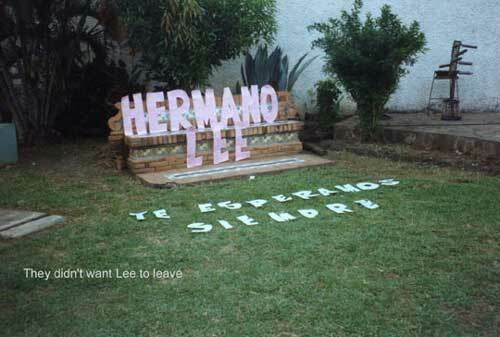 The weavers had been talking about Lee all day; they truly love him for the good man he is. They kept talking about the many things he has done for Nicaragua for hours after he left. Rosa Maria is a great cook. She did a lot of lunch preparation for me for my other hostesses, too. Yes, Mirna did cook for me at her house despite Cecilio’s doubts, but she counted a lot on Rosa Maria’s help. Rosa presents such a pretty plate for me, I assumed she had worked in a restaurant as a salad girl (okay, okay – salad woman? Salad person?). But she said no, she had never worked in a restaurant. She had had her own table to sell food on the street, that was all. “But I pay attention,” she said. She watches how it’s done on television. Smart woman.